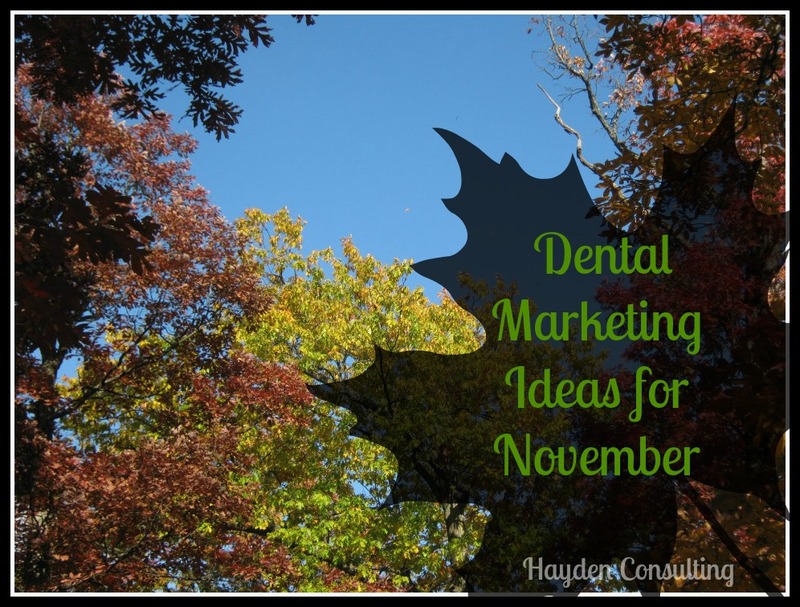 november dental marketing ideas – Hayden Consulting – Where Your Success in Business and Life Matters! National Clean Out Your Refrigerator Day: 15th – Time to clean out the office refrigerator. Candy Buy Back – Many of you will be starting off the month of November hosting and celebrating your office Candy Buy Back events. Consider doing a Facebook Live Video to promote your event. Be sure to alert the local TV news, online & print newspapers and social media sites about these events. Over 30 million Americans have diabetes. People with diabetes are 2 times more likely to develop serious gum disease. Use this month to educate your patients about the connections between diabetes and gum disease while they are in the chair and or via email, office newsletters, and your social media sites. International Stress Awareness Day: 1st – Share tips on how to reduce stress & the relationship between stress and oral health. Service/Treatment Feature: Mouthguards. Great American Smokeout: 16th – Wonderful Educational Opportunity to help your patients Kick the Tobacco Habit! As well as encourage youths to remain tobacco-free. Many of your patients will soon be attending holiday parties/events and typically with these special occasions come a lot of picture-taking. Now is a great time to help them see how they can easily get their smile ready for the camera with teeth whitening and other cosmetic treatment/procedures. Be sure to make available Dental Gift Cards/Certificates for purchase. World Kindness Week: 12-18 – Have Gift Of Health Certificates for your patients to share with their friends, co-workers, neighbors, and family. What about handing out special surprise gifts for your patients or deliver gifts to local businesses this week. Perhaps there is a patient coming in this week for treatment that is experiencing serious financial hardship and would benefit from some extra kindness by you donating some of their dental treatment. Black Friday – Offer Special Pricing on Teeth Whitening & Electric Toothbrushes, Ortho Consultation or a New Patient Visit. Flossing day: 24th – Post fun floss facts & tips on your social media sites. Make a video and share on Facebook, YouTube & Pinterest demonstrating proper flossing techniques. As always, I would love to hear your ideas for making November a great month! Should you need any help implementing these ideas or have any other questions that I can help you answer…I’m ready to help! Contact me today at bhaydenconsulting@gmail.com. Are you receiving my free dental marketing and practice management ideas every month to your inbox? If not, PLEASE take a second and follow today or send me your email address and I will send you an invitation to follow. This way, you won’t miss a single idea. Feel free to share my blog with your dental friends. ~ Thank you! I thought I would start this post with a lovely quote about the month of November, apparently, that was a big request as it looks like November is not a favorite for most. The majority of the quotes were about how awful the month of November is. Candy Buy Back – Many of you will be starting off the month of November hosting and celebrating your office Candy Buy Back events. Be sure to alert the local TV news, online & print newspapers and social media sites about these events. Nearly 26 million Americans have diabetes. Great American Smokeout: 17 – Wonderful Educational Opportunity to help your patients Kick the Tobacco Habit! As well as encourage youths to remain tobacco-free. Many of your patients will soon be attending holiday parties/events and typically with these special occasions come a lot of picture-taking. Now is a great time to help them see how they can easily get their smile ready for the camera with teeth whitening and other cosmetic treatment/procedures. Give Up Your Shoulds Day: 1st – The dictionary defines “should” as a word used to indicate obligation, duty, or correctness, typically when criticizing someone’s actions. Help your patients to give up some “shoulds” in their lives that often lead to guilt and stress. Such as: “I should schedule my dentist appointment” or “I should floss every day”; encourage them to turn these shoulds into something positive by seeing the value and personal benefit to flossing every day and/or being able to say they scheduled their dental appointment. It’s not something they “should” do but what they “want” to do to stay healthy. World Kindness Week: 13-19 – Have Gift Of Health Certificates for your patients to share with their friends, co-workers, neighbors, and family. What about handing out special surprise gifts for your patients or deliver gifts to local businesses this week. Perhaps there is a patient coming in this week for treatment that is experiencing serious financial hardship and would benefit from some extra kindness by you donating some of their dental treatment. Black Friday – Offer Special Pricing on Teeth Whitening & Electric Toothbrushes, Ortho Consult or a New Patient Visit. Flossing day: 29th – Post fun floss facts & tips on your social media sites. Make a video and share on Facebook, YouTube & Pinterest demonstrating proper flossing techniques. Have you signed up to receive my complimentary dental marketing and practice management ideas that are sent right to your inbox each month? If not, take a second and sign up. This way, you won’t miss a single idea! Many of you will be starting off the month of November hosting and celebrating your office Candy Buy Back events. Be sure to alert the local TV news, online & print newspapers and social media sites about these events. Do you have any patients with incomplete treatment or ones that are due/past due in hygiene with remaining insurance benefits that are going to run out at the end of this year? Do what you can to help them see the need and value in scheduling an appointment this month before the end of the year rush really kicks in to high gear! Use this month to educate your patients about the connections between diabetes and gum disease while they are in the chair and or via email, office newsletters and your social media sites. World Kindness Week: 11-17 – Have Gift Of Health Certificates for your patients to share with their friends, co-workers, neighbors and family. What about handing out special surprise gifts for your patients or deliver gifts to local businesses this week. Perhaps there is a patient coming in this week for treatment that is experiencing serious financial hardship and would benefit from some extra kindness by you donating some of their dental treatment. National Game & Puzzle Week: 24-30 – You could have a fun drawing for a Gift Basket filled with family games & puzzles. Flossing day: 29th – Post fun floss facts on social media. Make a video to share on YouTube demonstrating proper flossing techniques. I would love to hear all about your plans to make November a great month. Please comment below with your ideas. If you haven’t yet subscribed to receive these free dental marketing ideas via your email each month, please do so today. Feel free to share these posts with all of your dental friends!